After years of working in various engineering and robotics positions, Jeff Kondel decided he needed a change. So he moved his family from Indiana to Florida, unsure of where this new venture would take him. But he didn’t have to wait long. After networking with some fellow engineers one night, Kondel was asked to come to the local junior college to check out what they were studying in their robotics class, where he unknowingly took the first step towards his new career. Upon visiting the classroom, Kondel was surprised to see that students were learning robotics on outdated, antiquated systems. Some of which hadn’t been used in manufacturing plants in years. As he began to voice his concern, the college asked if he could guide them in the right direction. Kondel found himself saying yes, and his product – the Robotically Operated Open Training System (ROOTS) – was born. Andoni Goitiz, student at Manatee Technical College in Florida explains how his team created the UR3 application. Using sensors and actuators, the students made the system less manually operated and smarter by sensing positions, status and even configuration of blocks. With UR in the mix, Kondel estimates students can learn about robotics in one-third of the time. “The UR cobots are user friendly, simple to program, and work side by side with less risk. In fact, they’re so easy to understand the students can install the cobots by themselves” he said. 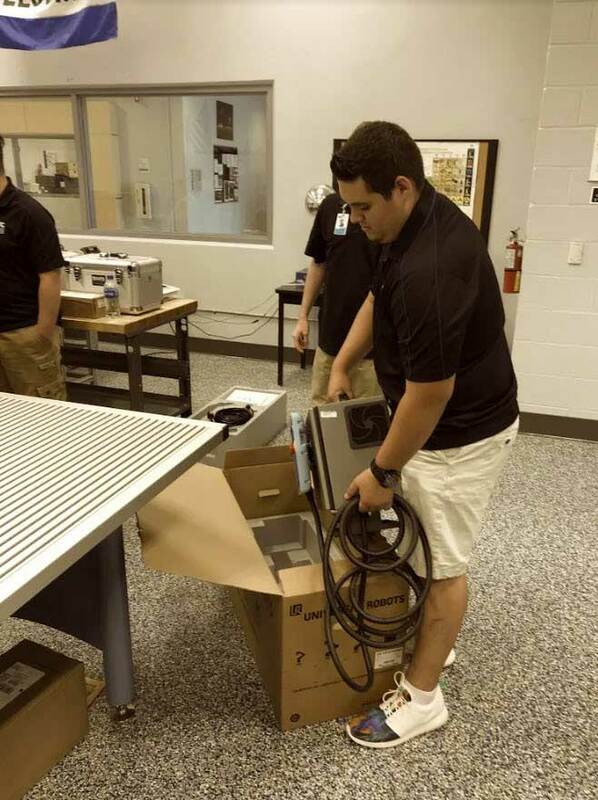 Now, with a reduction in training time required, students are set up to learn more each semester than in previous classes, where most of the time was spent trouble shooting the equipment rather than working on student-run projects. Having a UR cobot in the ROOTS program also means that the school’s facilities department can take free, online UR Academy classes in order to conduct simple maintenance and troubleshooting themselves – something no other robotics company can offer. That saves the schools approximately $150,000 annually that they would have otherwise spent on an integrator. The out-of-box experience unpacking the UR3 and getting it up and running was very fast. Students learn in about one-third of the time compared to other robotic solutions they’ve worked on. What began as an advisory role with Manatee Technical College (MTC) in Florida has now broadened, with plans to enter 20 more schools in and around Florida within the next six months – and hopefully a rollout throughout the United States in the near future. Recently, MTC had three students land jobs at Sun Engineering in Florida right out of school, for very competitive wages. Many of the students Kondel works with have parents who are so grateful for the program they make it a point to come into the school to thank him and the instructor personally – and sometimes that thank you comes with a hug. 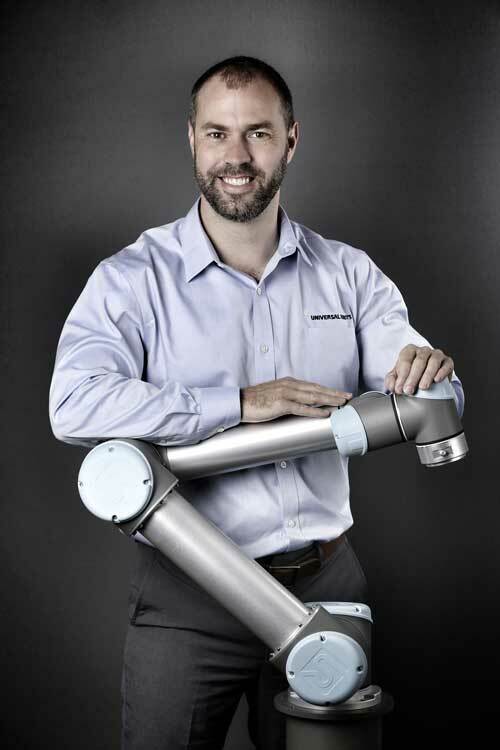 With 5 years in the field, Travis Langford is eager to help realize the promise of collaborative robotics and bring attention to Universal Robots in brand new areas of automation. He brings 7 years of sales experience and increasing leadership responsibilities, including positions with Keyence, Lockheed Martin in addition to 12 years of leadership experience as a combined United States Air Force active duty and Air National Guard officer. Travis currently manages the Southeastern distributor sales channel for Universal Robots in the U.S. and hails from Charlotte, North Carolina.